Soccer fans and commuters take note: the West Seattle route of the Water Taxi is offering extended service tonight (Thursday, Oct. 27), for the 7 p.m. Sounders playoff match — and we’re just around the corner from beginning our winter schedule. The West Seattle route of the King County Water Taxi will run an extended schedule Thursday, October 27, for the 7 p.m. Sounders playoff match. Sailings leaving downtown Seattle are scheduled 7:30 p.m., 8:30 p.m., 9:30 p.m. and 10:30 p.m. See the Water Taxi website for schedule information. Do you have your new timetable brochure, or a laminated pocket schedule? 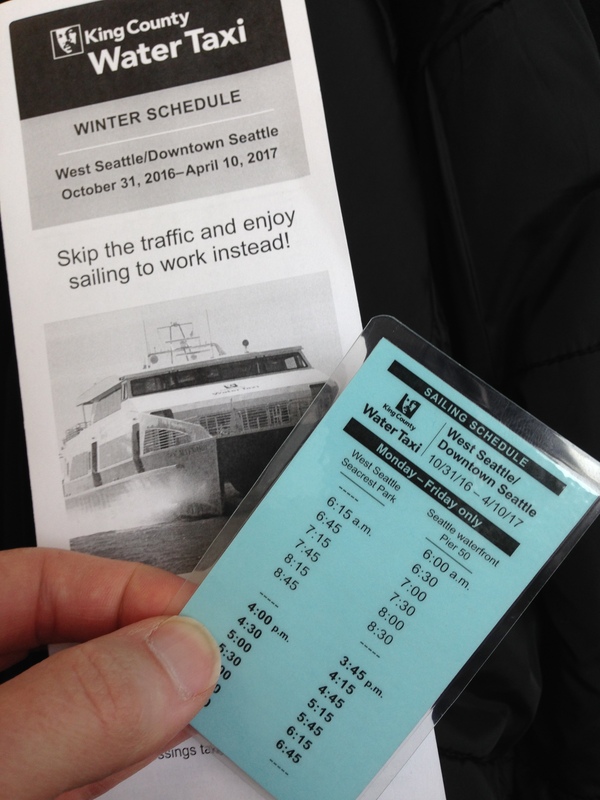 On Monday, Oct. 31, the West Seattle route of the King County Water Taxi will begin operating on its winter schedule. Service will be provided Monday through Friday during commute periods only (6-8:45 a.m. and 3:45-7 p.m.) through March 2017. No midday, weekend, or extended service will be provided. Please visit our website for schedule information. And if weather gets rough, check out the two free shuttles that bring you right to the dock to board the Doc. Sometimes bad weather can unexpectedly disrupt service. The King County Marine Divisions provides Water Taxi customers with email and text message updates regarding service disruptions and news that could affect your trip. Visit our subscription page. ← New record: Ridership soaring on the water taxi! Is there going to be increased service for the Monday night Seahawks game? When should I expect special schedules to be posted?